There are 11 comments on Belgium Radio DJ’s Make Attempt at Saying IZ’s name. this man has the most beautiful voice i have ever heard! i wish i could of known of him a long time ago! may he always rest in peace. LOVE this video, LOVE this man and LOVE his music, Iz lives…..
Merci a vous de passer cette merveilleuse chanson . merci a cette homme qui est si doux dans la voix et a mon avis devait avoir un coeur aussi doux et bon. merci a vous MONSIEUR IZ. Being Belgian myself, I am happy and sad at the same time. Happy because of the beauty of this song and the man bringing it. Also happy because the Belgian presentators are trying to pronounce his name but don’t succeed. Sad because this man has not lived long enough to enjoy his fame and sad because these presentators don’t know how to pronounce his name. Shame! DESCANSA EM PAZ MEU AMIGO,HALOHA! 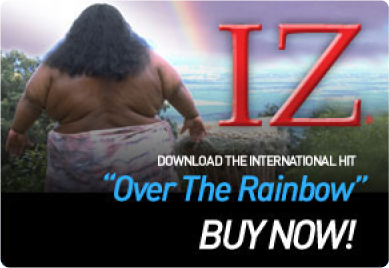 What IZ in a name, more important is what IZ inside the man…holy music…sorry he s over the rainbow now ! I agree, very sad ‘Iz’ did’nt come to fame in his lifetime, to hear the ‘depth’ and meaning in his singing voice brings one’s life home. RIP Iz thank you for the memory. Awesome. Belgium has the best beer and IZ has the best music. Great combo!!! My grandmother, who raised me, died last week and was buried this week. I chose Israel Kamakawiwo’ole’s song ‘over the rainbow’ at her funeral. It was in a rainy cold industrial town in January, in Belgium. Nowhere no rainbow to see. I just hope she can see it.